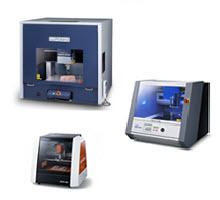 Roland subtractive rapid prototyping machines provide snap-fit, functional parts and prototypes milled from a wide variety of materials with smooth surface finish, tight tolerances and a low cost of ownership. Wide choice of materials. Choose from a wide range of non-proprietary materials, including non-ferrous metals, acrylic, chemical wood and popular engineered plastics such as ABS, Delrin and nylon. View material selection. Smoother surface finish. Compared to 3D printers, Roland's rapid prototyping machines deliver smooth surface finish without post finishing, as well as tight tolerances up to +/- 0.001mm. See the proof. Quick turnaround. Why wait for a machine shop when you can make models in-house for a fraction of the cost? Produce form models faster than any 3D printer and easier than any other benchtop CNC mill on the market with Roland's rapid prototyping technologies. Build time of 2.1 hours for 140mm by 45 mm by 7.5mm aluminum rocker arm. How Much Will SRP Save You? Lower cost of ownership. You can achieve savings of more than $20,000 over a 5-year period compared to a 3D printer. Fan part = $9.50 for materials. Review cost of ownership. With a Roland rapid prototyping machine and bundled software, the process of producing functional parts and prototypes couldn't be easier. Simply export your CAD model as an .STL file. Open the file in Roland SRP Player software and use the wizard to process your data. There is no worrying about feeds and speeds, cut depth, tool selection or G-Code programming. SRP Player does the work for you. "The seals I can create using the MDX-540 are tight enough for us to actually use the prototype to run the experiment." This short video shows just how easy it is to go from your design file to a finished prototype. See prototypes and functional models made with Subtractive Rapid Prototyping.